Accra, April 26, GNA - Britain has pledged 138 million pounds sterling to support Ghana's economic efforts for the next two years. This was announced by the British Prime Minister, Tony Blair at a press briefing after a closed-door meeting with President John Agyekum Kufuor at the White Room at Number 10 Downing Street in London. A statement issued by the Office of the Press Secretary to President Kufuor on Monday said Premier Blair pledged UK's continued support for Ghana's commitment to economic growth and poverty reduction. It said Britain was also committed to assist Ghana to ensure that all Ghanaian children were enrolled in primary school by 2010 and Premier Blair also announced a 16 million pounds sterling support for primary education in Ghana and another 362,000 pounds sterling for Ghana's troops deployed in Cote D'Ivoire. The statement said Britain had provided 2.5 million pounds sterling for the Koki Annan International Peacekeeping and Training Centre (KAIPTC) in Accra. President Kufuor as ECOWAS Chairman had steered the Sub-Region's affairs especially the modest gains realised in trouble spots like Cote D'Ivoire, Liberia, Guinea Bissau and Sierra Leone. 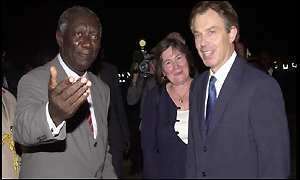 It said Premier Blair paid glowing tribute to President Kufuor for his leadership role and the sterling performance of his Government, adding: "President Kufuor is a role model on the African Continent and a blazing trail, who should be followed and emulated". The statement said President Kufuor commended Britain for the establishment of the Commission for Africa and expressed confidence that the Commission would help the G8 and the European Union (EU) to formulate appropriate discourse between the African Commission and the EU. It said President Kufuor reiterated his call for the restoration of the stalled World Trade Organisation (WTO) talks, which was crucial for the growth of trade in Africa. "Africa should be seen as a Continent in transition and as such should be encouraged to trade itself out of poverty", President Kufuor said. The statement said President Kufuor also had a breakfast meeting with the Commonwealth Business Council organised under the auspices of Sir Peter Middleton, Chairman of the Barclays Bank, as well a meeting with Ms Baroness Amos, Leader of the House of Lords.